Memories of the Second World War (1939-1945) seem to be among the strongest for some of the people contributing to this archive. For many it was a time of sadness within their families as relatives and friends were killed or injured but for some the war was also a time of excitement, camaraderie and community spirit. Of course most were children at the time. Wickford people had their own unique life stories while also sharing in the common experience. At the beginning of August 1939, less than a month before the war with Germany actually started, the government decided to carry out a practice blackout exercise in the eastern counties. Wickford was chosen as the site for a full scale Air Raid Precaution exercise. Volunteer air raid wardens were called upon from neighbouring areas to help. On the evening of 9th August prearranged ‘incidents’ would be set up. An umpire would blow a whistle to indicate that an imaginary incident had occurred and wardens hearing it would respond. The first to arrive would take command and call for the appropriate services, noting on a Form ARP/M.1 the time that they phoned and the time that the services arrived. Participants were reminded that “if a call box is used it will be necessary to have two pennies ready to insert into the coin box”. The incident planned for Wickford involved a small high explosive which would fall outside Brick House in the London Road at 2 a.m. in the morning. No property was damaged but 6 people walking home from a dance were injured by fragments and affected by gas. There was “a very strong smell of floor polish”, presumably the gas. The whole exercise would be carried out in real blackout conditions. A first aid ambulance and a car would respond. All seemed to go well because in a letter of 15th August 1939 Basil Brooks, Chief Warden of Billericay ARP area and local organiser of the practice, noted that in the event of a real incident the local ARP organisation would be able to “function efficiently”. Near the beginning of the war some families moved out of Wickford to get away from possible bombing while other families were evacuated to the village from London for the same reason. After the defeat of the British Expeditionary Force and the withdrawal of troops from Dunkirk in 1940 there was a very real fear that the UK would come under direct German invasion. This might easily come along the East coast with its easy access to London and the industrial Midlands. During the summer of 1940 many defences were constructed. 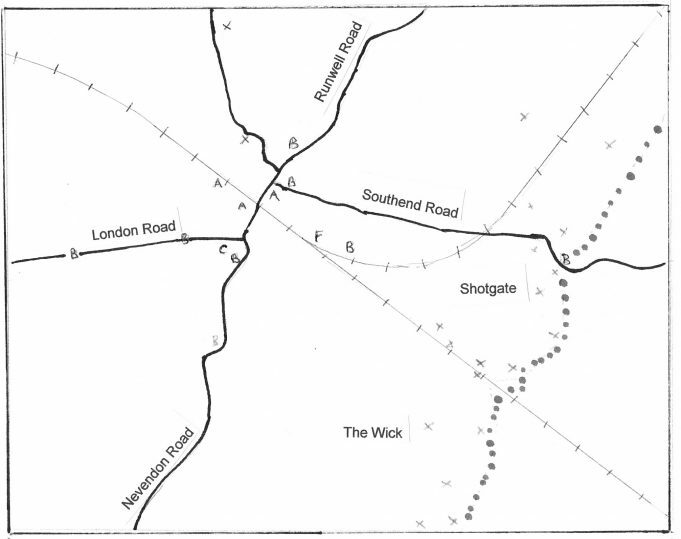 In Wickford locals noted that a large trench was dug to the east of the town, near Shotgate. This was part of a major anti-tank ditch known as the GHQ Line which stretched from the north of England, south to the Thames west of Canvey Island, then westwards to the Bristol Channel. At one stage individuals needed to carry their identity papers with them if they wanted to progress past Wickford towards Southend. Local defences took the form of street barriers, gun emplacements and pillboxes. Wickford had its fair share of these. There were concrete and metal barriers across the Runwell Road near Darby’s garage, the Lower Southend Road by the bridge, and across the London Road, one where the road crossed the Crouch and another by a house called The Laurels. Other barriers were located in Wick Lane, Wick Drive and the Nevendon Road. The ARP lookout station on the corner of London Road was surrounded by sandbags. There were three ammunition shelters in the town – south of the railway in what was the market ground, behind what was the Gas Light and Coke Co shop (59 High Street, now Coral’s), and behind the Castle Hotel. One strange feature constructed in the area of The Wick was a circle of searchlights . Several of these were erected in the south Essex area in late 1939 / early 1940. At night these would be lit up for about half an hour, perhaps to serve as decoys to German bombers. The “circles” were removed shortly after being constructed. There was a military camp of 30 huts on the corner of London Road and Nevendon Road. While there are no visible signs of any of the street-side structures, the remains of ten pillboxes, of an original seventeen, can still be seen, mainly around the Shotgate area and what is now the Wick Country Park. These local defence points would be manned by members of the Home Guard. Pill box in Wick Country Park . The Home Guard was a voluntary defence organisation originally called the Local Defence Volunteers (LDV). They were to act as a back-up defence force in case of an actual invasion and were particularly strong in coastal areas and where there were key facilities to defend. 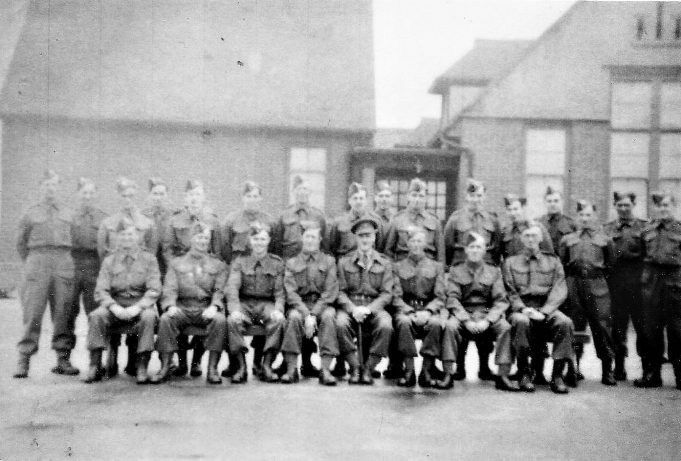 As of July 1940 the Wickford Company, later called “E” Company, was part of the 1st Battalion of the Essex LDV. The company was commanded by Mr (later Major) Stanley Mapleson. The Company came under the Brentwood Police Division and had sections, later called platoons, in Wickford, Crays Hill, Nevendon, North Benfleet, Runwell and Ramsden Bellhouse. The first LDV Battalion Officer was Colonel H.R Bowen, DSO, who lived in Brentwood and soon handed over to Col. Henry Burton, OBE, who, though MP for Sudbury, lived at Church Hill, Wickford. The first Wickford patrol was the first LDV patrol to operate. They were filmed for a news reel and photographed by the press at the time. [Does anyone know if a copy of the film still exists?]. Mapleson was experienced in weapons training so encouraged such activity within the Battalion, using a disused brickfield as a shooting range. The infants side of the School was used for some training purposes including drill practice. Mapleson took over from Burton upon the latter’s retirement in 1942 and remained until September 1944. Major H. C. Bear DCM, MSM, took charge of the Wickford Company. The Old Bank Buildings in Wickford were the HQ of the 1st Battalion. At various times the Battalion administration HQ was at Halls Corner, Wickford Hall and later Rayleigh, which was more central for the area it covered. Among the officers of the Wickford Company actually living in Wickford were Major Mapleson, Captain R W West, Lieutenant H Heald, Sergeant T Shewring, Lieut. B G Cousins, Sergeant R Sharman, Lieut. F S Tucker, Sergeant A E Truss, Captain R W West and Second Lieut. C Gladding. Thomas Frew, a young medical student, who later took over his father’s GP practice in the town, was another volunteer. See photo below. At the start of the war Wickford was subject to bombing, partly targeted but also because enemy aircraft would dump any unused bombs as they returned home from attacking London. The pilots would use the Arterial Road (the A127) and the railway line to guide them in and out of the capital. The first bombing of Wickford occurred on 25th May 1940. A high explosive bomb landed near South Beech Avenue, some property was damaged and some chickens and rabbits were killed. (Many families kept animals for food at this time). In the course of the war there were over 200 bombing incidents but only about half of these caused damage or injuries. The period between August 1940 and August 1941 was particularly bad, the summer of 1940 being the period commonly known as the Battle of Britain . On some evenings the orange glow of London burning could be seen in the night sky. Air raid sirens would go off sometimes several times a night. Among the areas hit were the Chelmsford Road, Castledon Farm, Cranfield Park, Brock Hill, Nevendon Road, Elder Avenue, and Rectory Road. One of the worst incidents occurred in Swan Lane on the 2nd October 1940, to the rear of the Swan Hotel, when Arthur, Gertrude and Molly Pratt were killed. Their house was destroyed. It is said that daughter Molly was due to marry and her wedding dress was found in a tree, where it had been blown. A second land mine landed in the nearby cricket field on the same night and added to the considerable damage of the first. Over 25 houses were damaged and 90 people made homeless. Enid Joslin remembered the same event: “I was sleeping under mother’s bed with my cousin – all our ceilings came down and the windows were smashed; you could stand indoors and look up and see the stars”. Another fatality occurred on 20th April 1941, one of the worst nights of bombing in the entire war. Frederick Brickdell, age 33, was killed and 7 others were injured when bombs were dropped on Browns Avenue. On April 15th 1943 a number of bombs were dropped near to the Senior School, causing it to be closed for two weeks. Apart from occasional closures like this teaching went on as normal except that it often took place in the shelters. Some wartime teachers returned from retirement. In the memory of one pupil “Dickensian was the type of education metered out …Pupils could get ‘the cane’ if they couldn’t spell a word correctly. We all lived in fear of making mistakes”. Some teachers were remembered more fondly, such as Miss Amos, Mrs Mason, Miss Holloway, Miss Keeling, Miss Rose, Mr Cole and Miss Brewster. On the night of 21/22 January 1944, a Dornier 217M1 came down over Wickford and crashed in Runwell. The remains of the aircraft were excavated in the 1970s. In December 1944 a long range rocket, a V2, exploded near Sugden Avenue, injuring 24 people, some seriously, destroying 2 bungalows and damaging many other properties. In May 1944 many soldiers of the Black Watch and the Highland Light Infantry were stationed in the fields near the Schools or billeted in local halls prior to leaving to take part in the D-Day landings. Many wartime memories tell of gas masks, the blackout, watching aircraft engaged in cat and dog fights in the sky, hunting around fields for unexploded bombs or bits of shrapnel or parachute silk, rationing, rushing for the air raid shelter, or, more likely as the war went on, not bothering to. In this context most just carried on with their lives, going to work or school. A final frequent wartime memory features the parties held to celebrate its end. 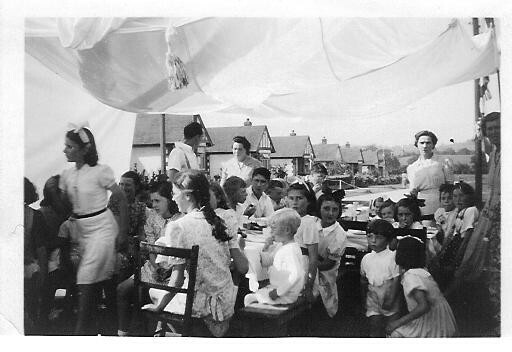 See photo below of Wickford’s V.E.day party in Louvaine Avenue 1945. Based on information from Nash, F. (2007) Survey of World War Two Defences in the District of Basildon. Local Heritage Initiative / Essex County Council. My father was in the Home Guard at Shotgate. He had a rifle; I know because I got a finger jammed in bolt. There was a gun emplacement at the back of no 9 Fanton Walk. My father, Arthur Reed served as a Private in the Wickford Home Guard from 17th January 1944 to 31st December 1944. I found his certificate a couple of years ago. Until then I had no idea he had served. He told me a story about the group being commanded by the headmaster from one of the Wickford schools. He said that they met in a dilapidated building and one night one of the Privates complained about the state of the place, and was rebuked by the commander. Before their next meeting they all received a letter advising of a change of venue. On the night they should have been at the old venue my father said it was hit by a landmine! His memory normally proved very reliable, so I have no reason to doubt what he said. Forgot to mention his name was Albert Marquis, ARP Warden. My Grandfather was in the local ARP. Does anybody have any photos or information about them? I would like to submit that my Aunt Lily and Uncle Fred Groves lived in 48, Kings Chase. She told me that a V2 dropped on the gardens at the rear of the houses and caused a lot of damage, blew out doors and windows. Fred was a tank sergeant during the war and fought Rommell across North Africa. I do recall, he had 5 tanks in his command at one time. Lily was a teacher in the school in Billericay; she was the Head Mistress before she retired about 10-12 years ago. She was a warden (black-out) during the Battle of Britain. She used to teach children down in the shelters in those days. Lily was born in Killarney, Co. Kerry (my Mom’s sister), she would not come home whilst Fred was out fighting the war. There is a mistake regarding the date soldiers were being billeted before D-Day, the year should be 1944 not 1945. The second world war ended 8th May 1945.